Chapel is an integral part of student life at Tipton Christian Academy and a highlight of the week for all students. Mrs. Sara White, First Baptist Church Children's Director, teaches the PreK through 5th Grade Chapel classes. 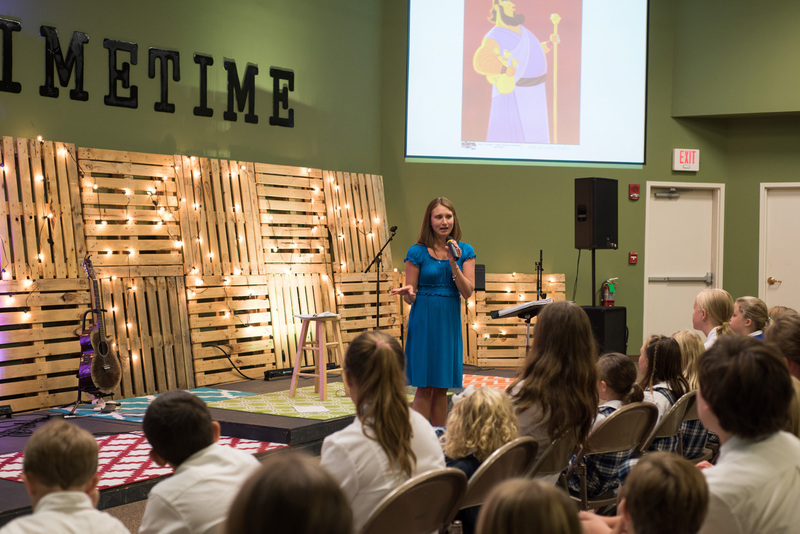 For students in Preschool through 1st grade, the foundational biblical stories and themes are presented using stories, songs and videos. The Old Testament is covered during the 1st Semester and the New Testament is covered during the 2nd Semester. Mrs. Sara coordinates with teachers to supplement the Bible focus already being covered in the classroom each week. For grades 2nd through 5th, the Gospel Project curriculum is used to guide the Chapel class lesson plans. The Gospel Project is a chronological study that begins the school year with Creation and ends in Revelation. The plan of salvation is also presented to students several times throughout the year. Chapel for Middle and High Schoolers is held Wednesday mornings and led by a rotation of guest speakers. Local pastors, community leaders and youth ministers are invited to come speak to the students on how that topic applies to their real-life ministry. The TCA Praise Band leads in worship songs. An offering is collected each week and is given to a variety of local charities, such as St. Jude Children's Research Hospital, Go Jim Go for LeBonheur Children's Hospital and the Hatchie River Region Boys and Girls Club.